Motley Fool contributor Rick Munarriz gave us the dish on Disney ($DIS) last week. His focus was Disney’s American parks, particularly the Pandora park (based on James Cameron’s Avatar movies) that opened earlier this year. We’ll take a look at Munarriz’ points and try to understand them in the context of Walt Disney Company as a whole. This global giant is at an interesting period of development. So should investors buy, sell, hold, or stay away? Munarriz’s main point is that Disney “World’s Pandora – the World of Avatar” is attracting patrons, but only at the expense of the other parks. The two new impressive Avatar attractions (and they are pretty amazing) contributed to 18% Disney World visitor growth May 27 – June 7, but the parks have only seen a 4% boost since then. It’s also important to note that as Pandora has attracted new visitors, The Animal Kingdom, The Magic Kingdom, Epcot, and Disney’s Hollywood Studios have seen associated declines. It’s a zero sum game for Disney World, one which has seen them cut park hours in the morning and evening, during a time when people should be flooding in. One point that Munarriz fails to examine is Avatar’s ongoing relevance in American culture. For those who don’t recall the 2009 film, it is still the highest grossing film of all time. It enjoys a comfortable margin of $600,000,000 over second place Titanic’s (also Cameron-directed) screen earnings. In financial terms, it’s a runaway success the like of which the world has never seen. But what about culturally? 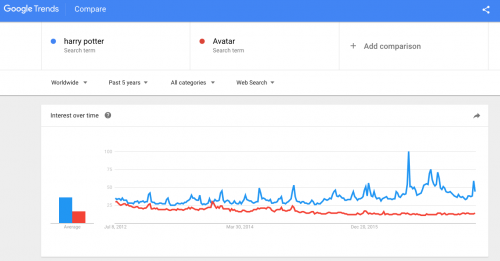 Does Avatar still command the public imagination? Let’s compare Avatar to another massive fantasy story to understand Pandora’s ongoing public interest level. Do you remember what happened in Avatar? I remember it being pretty to look at, but I can’t begin to recall the plot. Contrast that with the Harry Potter films and books, which have an unimpeachable story that continues to attract new Potterheads around the world every single day. The film critic in me wants to accuse Avatar of having style but not substance, and I think public interest validates that analysis. But! There’s a new Avatar movie coming out…someday. What was originally slated for last 2016 was delayed until 2017, then 2018, then not 2018 but eventually. It looks to me like Disney World made its massive investment in the Pandora park in expectation that a new Avatar juggernaut was coming down the pike. Not so, at least not for awhile, it would seem. I think Disney doubled down on Avatar long before it should have. With no new film in sight, expect the Pandora park to fizzle. Disney remains a remarkably solid company with a tremendous amount of assets and technologies, thriving subsidiaries, a massive movie business, big dividends for investors, and successful parks all around the world. The fact that Pandora – the World of Avatar is a flop is not going to sink Disney. But are their other strengths sufficient to make $DIS a Buy and/or Hold? I say if you have $DIS, keep it. There’s no sense selling now, as the stock has been slipping and sliding since 2015, with a summer long plummet in 2017. I say this because Disney’s upcoming movie roster is 🔥🔥🔥. Disney seems to be in a tricky period. They have an amazing amount of equity, still impressive revenues, but they don’t get much respect from investors. Still, they remain a dividend aristocrat, and a darling among dividend investors. Still, I don’t see much immediate upside here. If Disney continues to dive, I might sniff around once it reaches the $80/share range. For now, the cons seem to cancel out the pros. Munarriz limits himself to a consideration of park performance, and while there is much more to consider with Disney, that story speaks to a problem endemic with Disney – a failure to find game-changing solutions to drive real growth. Again, if you have it, consider hanging on, and keep enjoying those dividends. If you don’t, I’d wait for a cheaper price.